How are Euros created? What is the difference between central bank money and book money? Can you compare the European Central Bank to a miner? And how does the Lightning Network relate to banking? So many questions. Time to look for some answers. I have written here a few times how the monetary units of digital currencies are created. By Miner (PoW), Staker (PoS), Delegated Staker (PDOS) or by Original Issue (ICO). What I have not written about is how conventional money like Euro are created. The topic is a bit tricky, and I'm not an expert, but after doing a bit of research, I think I have some clarity. Incidentally, the information pages of the Bundesbank were particularly helpful here. In itself, this question is quite simple to answer: Euro in the pure sense can only produce the European Central Bank (ECB). It is the top and only euro miner and almost all the money in circulation is a kind of debt to the ECB. The feudal social order, in which every landed property was a "fief" - that is, a loan - of the emperor, is still somewhat echoing here. In the system of European banks, the ECB therefore takes the position of the imperial court. In order to create money, the ECB grants a so-called sight deposit for so-called central bank money to a bank. Central bank money is by itself the only real virtual money, and a sight deposit can be thought of as an entry in a bankbook like the Bitcoin blockchain. One could say that the blockchain of central bank money is double-restricted: only the central bank may mine, and only the banks are allowed to execute transactions. Like the Bitcoin miners, the central bank creates money out of nothing. Unlike the miners, the central bank can not draw the money for themselves, but only for the banks. To do so, they ask for a return from them: they either have to borrow a loan from the central bank or have to transfer an asset, such as public debt. The bank can use this sight deposit as a minimum reserve for its customers' payments (we'll get to that soon), or it can exchange them for cash to pay out to their customers. The ECB then has banknotes printed and coins minted and delivers them to the bank. Banknote printing is mandated by the national central banks, such as the Bundesbank, at private printers, while coins are stamped by government-owned mints. When a bank repays a loan from the ECB with central bank money, sight deposits are closed and central bank money is effectively destroyed. This shows perhaps more clearly than anything else that money in itself is based on debt or promises. For some tokens we find this again. Thus, the dollar token Tether are deleted when someone returns them to pay off dollars. Usually, the tokens are eliminated by sending them to an address to which nobody has the key. However, the Ethereum developers are also planning a "kill" feature for ERC20 tokens, which not only effectively destroys tokens, but also reduces the total number of existing tokens. The central bank money is called the money stock M0 or monetary base. It covers the outstanding cash and sight deposits of banks with the central bank. Currently, it is about 3.1 trillion euros. However, the amount of money actually used is much higher. The largest amount of money creation begins with the banks and runs off similarly as with the central bank: The banks give their customers a loan and write this as newly created so-called book money on its account. The banks can not do this indefinitely. They require a minimum reserve of central bank money in an ECB account of one percent of the book value. If a bank has one million euros in central bank money, it can credit its clients with 100 million euros. This book money is obviously not equivalent to the real central bank money. However, since the bank guarantees that it will change the book money into banknotes (like on an the ATM), and since it is accepted almost everywhere as a means of payment, the book money in public payments enjoys the same value as the central bank money. Logically, there is a lot more book money than central bank money. Adding sight deposits from bank customers to the monetary base, you get the money supply M1, which is currently about 7.8 trillion euros. If one adds the various, longer-term savings deposits of bank customers, one ends up with the money stock M2, which currently accounts for about 11.2 trillion euros. It becomes interesting, what happens, if the customer transfers a bank book money to a customer of another bank. Because the bank can not simply transfer the money that it has created to another. Instead, sight deposits are adjusted at the central bank. However, this does not happen with every transfer, but is charged after a certain time has elapsed. To this end, the banks pass on their transactions to so-called SEPA clearer, such as STEP2 of the Euro Banking Association or the clearing house of the German Bundesbank. These collect the transfers, balance them and then pass them on to the ECB. Let's assume that a customer of Volksbank Berlin transfers 100 euros to a customer of Commerzbank. In itself, then the sight deposit of the Volksbank Berlin would have to be lowered by 100 euros, and those of Commerzbank be increased by the same amount. But if another customer of Commerzbank sends 80 euros to another customer of Volksbank Berlin, all that remains is an adjustment of sight deposits by 20 euros. And so on. By aggregating the payments, banks can meet their payment obligations, even though only one percent of the book money is covered by central bank money. 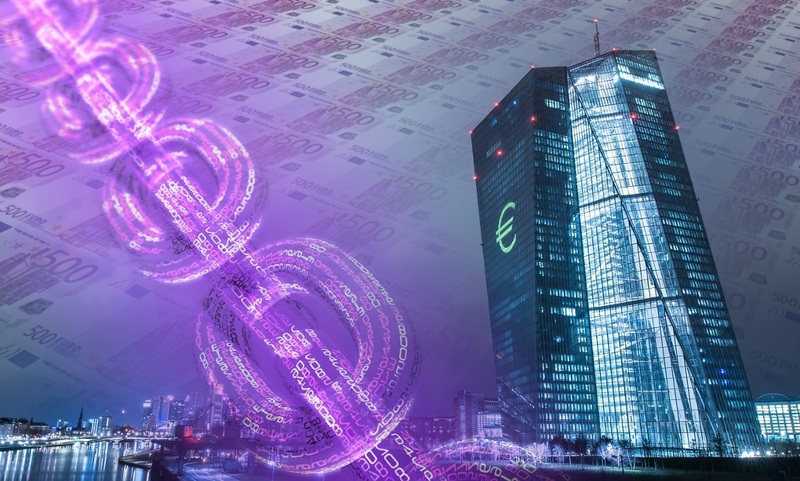 One could say banks use sidechains or payment channel networks before a transfer reaches the mainchain at the ECB. A very similar model is being sought by Bitcoin, where the size of the base blockchain should be kept low, while other layers like the Lightning network should enable high-volume payment traffic. The final transfer to the ECB - ie the call to adjust sight deposits - is usually done with the Target2 instrument, which is also used to make pan-European express payments. Target2 has some striking statistical similarities with Bitcoin: individual transactions cost between 10 and 65 euro cents, which is close to the bit rate of Bitcoin, depending on the volume, and the daily number of transactions is almost identical to Bitcoin at about 340,000. The value is 1.7 billion euros but much higher. One can compare the Bitcoin blockchain with the ECB sight deposit account book, and so-called Second-Layers at Bitcoin, such as sidechains or, above all, the Lightning network, with the SEPA clearers, first offsetting payments between the banks before they instruct them to adjust the ECB sight deposits. For a euro area size payment room, the capacity that Bitcoin currently has seems to be enough to serve as a base layer. However, there are some serious differences between the Lightning network and the banks' networks: First, Lightning does not charge book money, but each payment is 100 percent covered. Second, each customer can interact directly with the base layer and the clearing networks. He can always make a real Bitcoin transaction or build a payment channel with any other party. Lightning promises to copy the benefits of the banking system, but to forego the disadvantages and to preserve the elements that make Bitcoin valuable. Can Lightning Hubs become the new Banks? Of course, one could still think about scenarios in which Lightning is closer to the conventional banking system and training supernodes that perform similar functions as banks. All this is purely hypothetical; to make serious statements, I still lack the knowledge. But I found it very exciting to think about it. So it would be conceivable that, for example, the access to the mainchain to real Bitcoin transactions - is limited if the fees are prohibitively high. Or, within the Lightning network, there could be a subnet of hubs that entertain many large channels, and these could be regulated to only maintain channels to customers or other regulated hubs. In that case, users might need a direct channel with a hub, at least for larger payments. Lightning hubs could play the role of goalkeeper in real Bitcoin transactions, much as banks do for real central bank money transactions. Furthermore, scenarios are conceivable in which the Lightning network could lead to a partial reserve system. For example, hubs could process payments from their customers, even if they are not fully covered by a channel. Or the network of the big hubs could need only a fraction of the coins stored in the channels to fulfill their payment obligations, that is to say to forward payments of the nodes connected to them with a flowing balancing of the balances. Also, such hubs can playfully offer online wallets that are only covered by a fraction of the Bitcoins credited to customers, or assign the same payment channel to multiple customers. There are relatively many - purely hypothetical - ways in which the hubs in the Lightning network can evolve similar to banks. At the same time there are just as many and even more possibilities that they develop completely differently. I do not know any indication that such developments are planned, and it should be clear to everyone that the introduction of Bitcoin book money will encounter significant opposition from the scene. It is unlikely that this will even be accepted. Moreover, exchanges and online wallets would have long had the opportunity to use real bitcoins as a partial reserve to generate book Bitcoins by lending. Many trading platforms retain 98 percent of the customer Bitcoins on cold wallets. The remaining two percent is enough to meet the daily payment obligations. It would have long been possible to form a Bitcoin bank that generates digital book money with 10 percent reserve Bitcoins. This did not happen yet. Therefore, thinking about how Lightning duplicates the banking industry is nothing more than an interesting mind game. Centrality is a project of the New Zealand blockchain venture firm "Centrality Investments Limited". The 75-member team in Auckland, London, Melbourne and Singapore is sponsored by global investors. 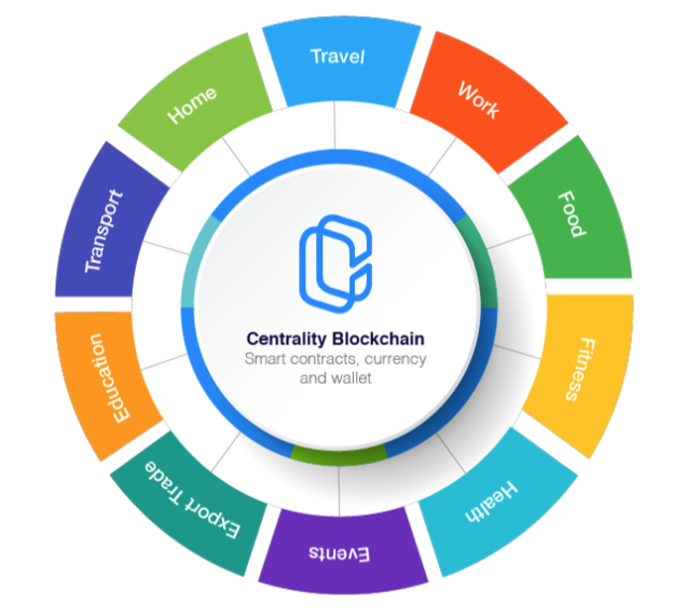 The Centrality Team, with the vision of helping the world transition to a blockchain-enabled future, develops and operates a decentralized blockchain-based platform. The Centrality Platform is legally "Centrality Platform Pte. Limited ", which was founded in Singapore on January 4, 2018, as a subsidiary of Centrality Investments Limited. Centrality is a graph theory concept in which a network is represented and analyzed as a set of nodes (actors of a network) and edges (relationship between the actors). Centrality in networks can be measured in different ways to say something about the importance of the nodes and their connections. With the help of centrality metrics we identify, for example, the most important players in a social network according to their influence, their role as hubs in logistics networks, or the nodes that stabilize and protect a network. For example, search engines use the PageRank, which is related to eigenvector centrality, according to which a node (here the page) is the more important the more important its neighbor nodes are. Or we determine the most important node through the so-called "closeness" centrality, measured as the length of all shortest paths between a node and all other nodes. According to this metric, one actor in the center is closest to all other actors. 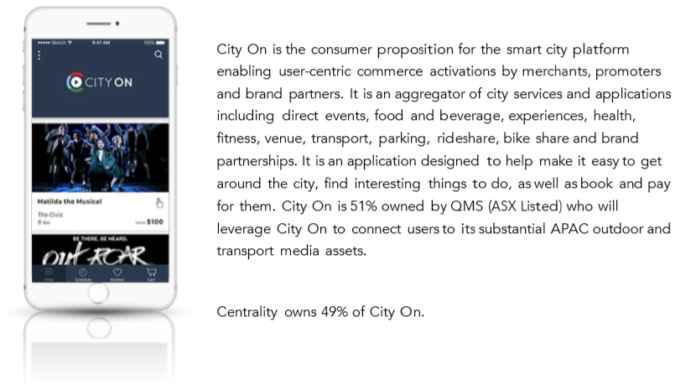 Centrality describes itself in its white paper as a platform that allows developers and entrepreneurs to find and create the connections between their applications so that more closeness centrality or proximity can be achieved. Centrality provides the platform as "the foundation of the marketplace". Applications enter the market via the platform. Users who log on to an application can immediately register to other applications. Each application can focus 100% on their own business, on appropriate partnerships and onboarding new users. Our world is driven by technology and digitization and more and more connected. We are increasingly realizing the potential of decentralized systems. Blockchain technology and its applications play an increasingly important role as architectural building blocks of such decentralized systems. Especially when new technologies come onto the market, certain factors such as resources (capital, time, market position, etc.) determine the success, even economic ones. The Centrality ecosystem as a marketplace for applications is already fully functional, DApps-integrated, and productive in use. Users can use all of these applications through a log-in using blockchain-enabled infrastructure. Nearly 10 applications are currently generating revenue in a rapidly growing market. The list of decentralized Centrality Apps is already impressive. Among them the Crypto Trading platform Singularix, or "CITY ON" and "merge" apps for smart cities. The Centrality platform is implemented as a consortium-based Ethereum blockchain with a number of performance and security optimizations. This design aims to (1) reduce latency and congestion, (2) avoid transaction fees, and (3) prevent network stress due to large transaction volumes. To achieve a seamless integration of the applications, Centrality uses user profiles in the form of a Smart Contract with an Ethereum address as the ID. Users can manage their profiles themselves. "Login with Blockchain" allows users to connect to non-Blockchain applications via their profile. Centrality has developed a hybrid wallet so that payments in both fiat and cryptocurrencies are possible. Centrality's Big Data engine provides the application with various services such as reporting, data analysis, machine learning and artificial intelligence, provided the users have given their consent. 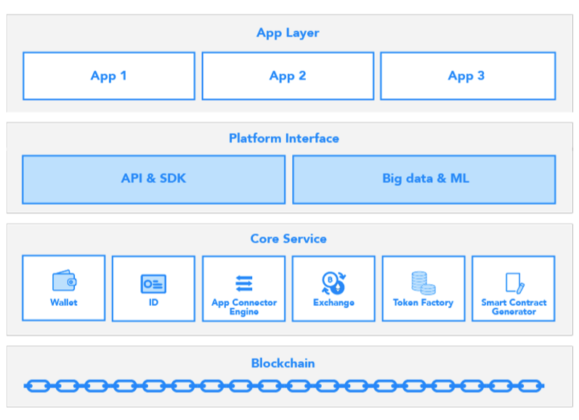 In order to connect different applications in a specific way, Centrality provides an App Connector Engine with its SDK. This can be used to specify how different apps and processes interact with each other. According to Coingecko, Cryptopia currently trades 98% of its volume for BTC at a price of approximately $ 0.28. All Fiat currency is debt. All Fiat is borrowed into existence. When it's payed back it gets destroyed. Hence there is no such thing as money(real). Since it gets destroyed after being borrowed into existence. So perpetual debt has to be for money to exist at all. "Money, it must have intrinsic value – independent of any other object and contained in the money itself"
I found this to be a HODLtastic article. I've never seen a BTC/Euro comparison before (how BTC/Euro is created/distributed/etc). I do agree that most people don't want BTC to emulate the banking system, and there will be resistance. People got into BTC because they don't like banks, and how they inflate the currency. BTC/BCH and other cryptocurrencies can't be inflated at will, that is the big difference. "Unbank the banked" as they say. People have to invest in stocks/real estate/precious metals/Crypto, because otherwise, their savings are going to get eaten away by inflation (in the US where I live it's bad, in places like Venezuela it's literally deadly). The value of Crypto to fiat will keep increasing due to the inflationary nature of Fiat. If HODLing was a crime, lock me up and throw away the key. American here, I agree with you so much man. I know people say not to put in more money than you can lose, but I have been watching this project since 2013 and I really dont see it going away soon. Once people relaize that they dont have to have a bank anymore and that the government are just money hungry fiends then we will get our Yachts. HODL. Hello, it is my first comment in steemit, I like your comment, Blockkade, I see you are right!! yeah man thats the truth! The Fractional reserve banking scheme is making money out of thin air, then these crooks have the audacity to charge us ridiculous interest rates. Soon cryptocurrencies will stop this corruption as less sheep use fiat money!!! All fiat will collapse. I can't wait to see what happens! ECB isn't even a miner. The Euro is more like a token that the underlying company keeps on making more of. With the simple difference that their value always stays at 1 Euro. So inflation is at play with the Euro. Blockchain would likely be a good way to battle inflation while it is being traded against fiat currencies in order to obtain utility. If we were to have a fully integrated blockchain world I would imagine that there would still be some inflation but a lot less than now. Thanks for the information you added to the post and your opinion. WOW WOW WOW, you are a whale now! BIG CONGRATS!! Thank you but no I am not a whale I just promote my posts with the help of upvote bots for more visibility. You take care and we talk soon I will check out your blog later now I have to do some more work and we talk soon. Seriously man, You are great. Today I got a lot of background information of coins as well as euros !!!! I think CENNZ is a really exciting project. Perhaps one can look into acquiring some coins. I see that it took a dip from $0.28 from the time you made the post to $0.27 at the time of this comment. Maybe it might take a further dip, then perhaps one can secure a few coins. It would be wise to take advantage now before it gets added on other exchanges because then it's just gonna soar. Blockchain technology is literally the future of cryptocurrency, and Centrallity is being more futuristic here with its capability in the connection of different apps. This is the future! Thanks for the enlightment and thoughtful post @danyelk. absolutely...... good, very compact analysis - like it that form ! Kepp it up! You are helping this way Steemit and the blockchain! The more people like you better for the Civilization!!! Yup and he was right I know his quotes for a very long time but sadly many people don't. Thanks for sharing this detail information post now i am going to follow you. Your welcome glad you like it and thanks for the follow. Hi @danyelk. The cryptocurrency is banned by State bank of Pakistan. I am worried about this. I suggest you to write article about cryptocurrency situation in Pakistan. dear sir, I think you know better How Euros (€) are born - and what that could mean for Blockchain Money. I surprised because you know better this matter. Oh man, life is really changing fast. Gone are the days when we're all stupid. Computer, the internet and everyone is changing and advancing in this digital age. Your post is very important and very nice post. I like your post and upvoted please give me a 1upvoted 100%. I well always response you. Thank you @danyelk. I join in congratulations, well done guys! This number of users speaks only one thing. That the project is interesting and it is actively developing. Forward to new heights! Great news guys! Such indicators speak only about one thing, users want to know about the project and this is a movement towards the set goal! Forward and only forward! Thanks for sharing this useful information, upvote for nourish us with knowledge! This post is very good. I was don't know about this case. Thanks for this post it's very helpful and profitable post. Keep sharing with us. I was surprised after reading this. My thought about euro just changed. Me parece interesante tu publicación, tiene suficiente información, gracias por compartirla. Hello, at everyone I am from Africa Nigeria. If you do check the Nigeria economy you will know that things are not going well for us. I am new here in steemit, I will appreciate if you please visit my blog, cause things are not just going well with us here, I came to steemit to earn a living cause there is no job for us, if you do please visit and upvote, I will be very happy, and your upvote is what will help me grow and maybe give me food for that day I came from a poor background and we all cry to eat. please at everyone you can add something. Please don't be offended if this makes you feel inconvenience. Thanks for reading at everyone. I hope to have a look at the news I post in my account On Steemit and tell me what you think . if you like to add some point? Saludos caramba, me impresiona los trabajos que presentas tremendos diseños, contenido, presentación.. waoooo de calidad absoluta. gracias por compartirla.. I think CENNZ is a really exciting project. Perhaps one can look into acquiring some coins. I see that it took a dip from $0.28 from the time you made the post to $0.27 at the time of this comment. I will be very aware of your post because with the one you just published I learned a lot. Wow this is a great post.It has a good information. Please could you help boost me up a bit. Really nice article. Thanks for time. 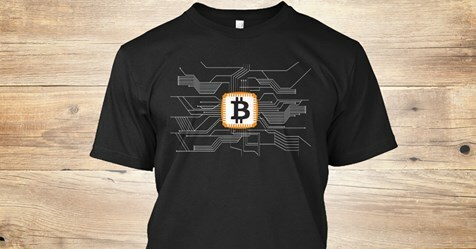 crypto currency and block chain, the allure is "decentralization", no middle man, or intermediaries, ............. I've read this and I am new, but just from a marketing standpoint, ..............the name "centrality" ??? Wow........... This is what I call get a load of this. Me hiciste recordar mis clases de introducción a la economía, cuando nos hablaban que anteriormente todas las monedas del país estaban soportados en oro que se tenia depositado en el banco central del cada uno de los paises, posteriormente se cambio al patrón plata, mas adelante se inicio con el patrón libre donde el papel moneda emitido por un país, esta soportado en las reservas en dolares que tiene el país como reservas. el dinero que se emite sin respaldo, se vuelve inflacionario y afecta gravemente las economías. Muy interesante tu publicación, te voto y te sigo. Your posts are wonderful my love, it's just a lot of help for people like me who have a lot of ignorance in the subject, with simple words you get to understand perfectly, thanks. This post is interesting and nice. It is helpfully . I like your post, I hope you keep sharing so interesting content, greetings! What you will do if you find the time??? @danyelk digital currency and blockchain technology,companies are not holding back in adopting currencies like bitcoin. Centrality is one of the leading blockchain venture studios globally.It is made up of a team of 75 members located in Melbourne, Singapore, Auckland, and London. They are a global network of investors who are driven by a strong vision. The company’s vision is to help the world move to blockchain technology. Centrality has developed a hybrid Wallet,so that payments in both Fiat as well as crypto currencies are possible. Thank you for explaining it in a very clear way. Very informative post, I like it very much and see it the way you see. to be honest, i just HATE banks and the EUROPEAN finance system. CRYPTO FOREVER!!! This was a hard work for you. this info is so educative. Very good and excellent post. Lightning Hubs I think is still very young. It could be banks of the future but until further developments are done, then it will just be what it is now. Would you trust your bank if they told you that your money is gone because we were robbed? You got a 15.12% upvote from @postpromoter courtesy of @danyelk! The article is very interesting! If you are interested in ico subscribe to me, I will also be mutually subscribed. thanks for this great and useful article. Can you please take these images out of my post please if not I will flag it. If you need to raise money do a post with all the information but stop writing these comments in my post. If you done a post I will upvote it. Please edit your comments and take out these images and I will remove my flags. Take out these images and I remove my flag!! !